Perma-bears were out in full force last week when the yield curve partially inverted, signaling a pending recession. That turned into quite a buying opportunity for investors smart enough not to drink the Kool-Aid. The yield curve is simply a measure of interest rates from short-term Treasury bills to long-term Treasury bonds. The "inversion" they feared was simply due to the three-month rate moving above the 10-year rate. And here we are a week later, and that deadly inversion is gone. Baron Rothschild was right – buy when there is blood in streets! To be sure, the yield curve is not exactly at its healthiest alignment, but even if the two-year yield rises above the 10-year yield, a recession won't happen immediately. True to form, our experts did not panic. Money Morning Quantitative Specialist Chris Johnson didn't take the bait. 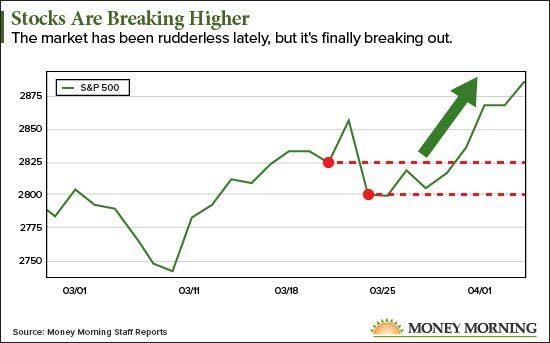 He dug into the technical indicators in the S&P 500 and predicted a breakout higher was coming just as the media was hyperventilating over recession fears. And a breakout is exactly what happened. Take a look at the chart Chris zoned in on. As you can see, he found the resistance levels (the red lines) that were keeping stocks boxed in throughout March. And he knew that meant the surge above the upper resistance was just a matter of time. Chris nailed the breakout, but he wasn't looking at just the chart. He looked at many conditions in the market, including a healthy change in leadership. Small-cap, housing, and semiconductor stocks reigned supreme in February as they moved higher. But now, the market is being led by utilities, consumer staples, and real estate. Not to be left behind, the transportation sector just woke up, too. After more than a year of lagging behind the market, the Dow Jones Transportation Average finally sparked to life. Chris is looking for big, powerful catalysts to keep the good times rolling. The Mueller report is behind us, China seems to be more willing to talk, and any news coming from Brexit will be better than what we've already seen. Earnings are expected to be pretty good. But those good times do not have to last for months for us to make some big money on short-term trades. In fact, if the S&P 500 only gets back to last year's highs, we should be able to do some nice business. That's why we are looking at using the power of options to capitalize on the current market's bullishness.